CORSIER-SUR-VEVEY, Switzerland – United World Wrestling, the international governing body for the sport of wrestling, has named 15 former wrestlers, coaches, officials and community members to their 2016 Hall of Fame class. The class will be presented on Aug. 12 in Rio De Janeiro preceding the start of the wrestling competition at the 2016 Olympic Games. The Hall of Fame class will include one Order of Merit recipient, two Leadership recipients, one Officials recipient, two Coaching recipients, two Female freestyle recipients, three Men’s freestyle recipients, and four Greco-Roman recipients. Wrestlers from 11 countries are represented in the class with a total of seven individual Olympic gold medals and 17 individual World Championship titles included in their combined accomplishments. United World Wrestling will host the 2016 Hall of Fame inductions at the: Nautical Club in Mandala Condominium Av. Pref. Dulcidio Cardoso 777, Barra Da Tijuca, Rio De Janeiro, Brazil. 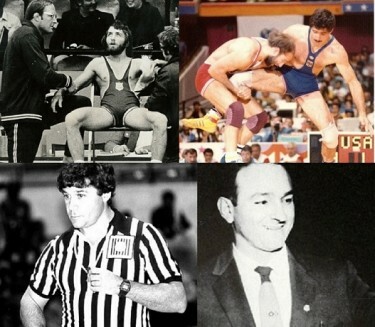 For more information about the induction ceremonies and to view all United World Wrestling Hall of Fame inductees please visit www.UnitedWorldWrestling.org. Rick Tucci (United States): Officiated eight Olympic Games. International Instructor from 1990-2012. Officiated 75 World Championships at the Senior, Junior, and Cadet levels. Presented FILA Golden Whistle in 1988. Awarded two FILA Gold Stars. President of USA Wrestling Officials Association since 1986. Inducted into the National Wrestling Hall of Fame as a Distinguished Member in 2001 and received the Meritorious Official award in 1994. William “Bill” Farrell (United States): Posthumous. New York Athletic Club President and Coach. Coach of 1972 USA Freestyle Olympic Team and medalists Dan Gable, Wayne Wells, and Ben Peterson. Coached 13-time World and Olympic medalist Bruce Baumgartner. Inducted into the National Wrestling Hall of Fame as a Distinguished Member in 1987. Victor Kuznetsov (Russia): Coached three-time Olympic Champion Alexander Karelin and 2012 Olympic Champion Roman Vlasov. Manuel Andrade y Rodriguez (Mexico): Mexican Wrestling President 1972-1980. FILA Bureau Member 1978-1982. FILA Vice President 1980-1982. Department Head of Olympic Games in Mexico City 1968. Joe Scalzo (United States): Posthumous. FILA Vice President. Founder and Organizer of FILA World Cup in 1973 and hosted the first 13 World Cups in the USA. Organizer of 1962 and 1966 World Championships. Inducted into the National Wrestling Hall of Fame as a Distinguished Member in 1987. Ine Barlie (Norway): World Champion 1987 and 1992. World Silver medalist 1989 and 1991. World Bronze medalist 1990. Martine Dugrenier (Canada): World Champion 2008, 2009, and 2010. World Silver medalist 2005, 2006, and 2007. Anatoli Kolessov (Russia): Olympic Champion 1964. World Champion 1962, 1963, and 1965. Hector Milian (Cuba): Olympic Champion 1992. World Champion 1991. World Silver medalist 1993, 1995, and 1999. World Bronze medalist 1997. Stefan Rusu (Romania): Olympic Champion 1980. Olympic Silver medalist 1976. Olympic Bronze medalist 1984. World Champion 1978 and 1982. World Silver medalist 1985. World Bronze medalist 1981. Janos Varga (Hungary): Olympic Champion 1968. World Champion 1963 and 1970. World Silver medalist 1961 and 1967. World Bronze medalist 1962 and 1971. David Goedishvilli (Georgia): Olympic Champion 1988. World Silver medalist 1986. Olympic Bronze medalist 1992. World Champion 1985 and 1990. Jang-soon Park (Korea): Olympic Champion 1992. Olympic Silver medalist 1988 and 1992. World Champion 1993. Dave Schultz (United States): Posthumous. Olympic Champion 1984. World Champion 1983. World Silver medalist 1985, 1987, and 1993. World Bronze medalist 1982 and 1986. Inducted into the National Wrestling Hall of Fame as a Distinguished Member in 1997. Dr. Harold Tunnemann (Germany): Sport scientist involved with international wrestling since 1973. Currently a member of United World Wrestling scientific commission and head of video analysis team. Author of more than 200 articles and the book “Fitness and Strength Training” which has been translated into five languages. Editor of 60+ pedagogical Olympic and world championship highlight videos. Helped produce groundbreaking ‘Wrestling Database” with Dr. Hartmut Sandner. Competition management support at 11 Olympics and 200+ continental and world championships.